Since the book was first published in 1999, The Gruffalo with his award winning story of his encounter with the little brown mouse in the deep dark wood, is the world's best loved monster and he continues to delight children and adults all over the world. Created by the most successful author/illustrator partnership (Julia Donaldson and Axel Scheffler) in picture book publishing, both mouse and monster have become stars of screen and stage, as well as The Gruffalo becoming an all time story favourite! Five years after the publication of The Gruffalo, a new adventure was introduced to the world - The Gruffalo's Child, starring in her very own adventure and proved an instant hit! In 2005, the book was voted for The Children's Book of the Year at the British Book of the Year Awards. 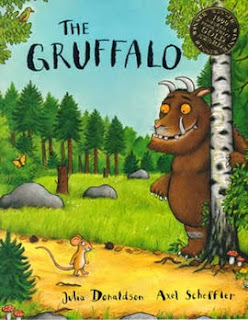 The Gruffalo too has won many awards, including the Blue Peter Award for The Best Book to Read aloud, the Nestle Smarties Prize and in 2009 it was voted the UK's favourite bedtime story! However, just because it's won awards in the UK, it doesn't mean The Gruffalo isn't a hit with children and adults anywhere else! The story has been translated into over 50 languages, including Russian, Maori,, Thai, Scots, and even a Latin edition for Classics scholars! Truly an international phenomenon, both of the books have been made into hugely successful films, as well as being adapted for the stage! This year, between Wednesday 1st July and Sunday 6th September, The Lyric Theatre (Shaftesbury Avenue) in London is hosting a number of performances of the hit show! Join Mouse on a daring adventure through the deep dark wood in the search for hazelnuts, she then meets the cunning Fox, the party mad Snake and the eccentric old Owl, armed with only a nut map and very little courage, Mouse must make sure she doesn't end up as dinner for these willy woodland creatures, so she outwits them all with the story of the fabled Gruffalo! 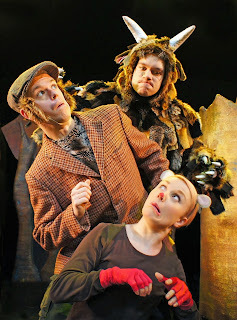 If you're up for laughter, music, physical theatre and just the right touch of scary fun, Tall Stories' The Gruffalo is the must see family show for lovers of the timeless story, and after all who wouldn't want to see everyone's favourite furry monster live on stage? With Picadilly Circus being the nearest tube, you'll have nothing to worry about when trying to get to the venue easily! If you're staying over in London for the night or weekend, the Holiday Inn Kensington Forum hotel is just around the corner too, ensuring a lovely night's sleep or two! I'm booking our tickets for a night away in the capital as a surprise treat for Spud next week, I'm unsure on what date we'll be attending yet, however I may see some of you there!